The perfect St. Patrick's Day gift, and a book in the best tradition of popular history -- the untold story of Ireland's role in maintaining Western culture while the Dark Ages settled on Europe. Every year millions of Americans celebrate St. Patrick's Day, but they may not be aware of how great an influence St. Patrick was on the subsequent history of civilization. Not only did he bring Christianity to Ireland, he instilled a sense of literacy and learning that would create the conditions that allowed Ireland to become "the isle of saints and scholars" -- and thus preserve Western culture while Europe was being overrun by barbarians. In this entertaining and compelling narrative, Thomas Cahill tells the story of how Europe evolved from the classical age of Rome to the medieval era. Without Ireland, the transition could not have taken place. Not only did Irish monks and scribes maintain the very record of Western civilization -- copying manuscripts of Greek and Latin writers, both pagan and Christian, while libraries and learning on the continent were forever lost -- they brought their uniquely Irish world-view to the task. As Cahill delightfully illustrates, so much of the liveliness we associate with medieval culture has its roots in Ireland. When the seeds of culture were replanted on the European continent, it was from Ireland that they were germinated. In the tradition of Barbara Tuchman's A Distant Mirror, How The Irish Saved Civilization reconstructs an era that few know about but which is central to understanding our past and our cultural heritage. But it conveys its knowledge with a winking wit that aptly captures the sensibility of the unsung Irish who relaunched civilization. Heavy going for non-academics, but a brilliant review of a thousand years of lost history. A necessary foundation block for a well rounded understanding of who we are. On balance I am glad I listened to it but it was a bit of a slog sometimes. It's not bad, but the author is rather indulgent with himself and his love of the history and the language so never gets around to telling the story. So, its enjoyable enough if you wanting a rather meandering wander through the dark ages, but I'm not convinced the Irish saved civilization. This is not for the light hearted reader who likes story with history. Too many words, too long sentences. When one listens to a book rather than actually read it, and when one does so in a car, dozing presents a whole different problem! Having said that the author build a fine case well supported to its title. If you are of Irish descent, you will swell with pride over our past history and delight at the great heroines and heroes who enrich Irish history. This CD just rambled on with the most boring information. I kept hoping that it woudl get better- but it didn't. The only thing of value that I got from it was this statement. Freud said he wouldn't even try to analyze the mind of an Irishman.. I needed that laugh! 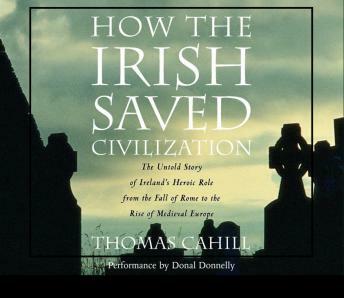 Cahill's pro-irish, pro-Catholic sentiments bleed through, but the overall message, that the classic Latin literature would not have survived without Irish monk-scribes is presented with an entertaining potpourri of native Irish literature and a worthwhile chronology of the development of Ireland from the Celts to the 19th century. I'm not Irish and think that many who are reading this book might be. However, I REALLY got alot out of this book. It started off a little slowly but enlarged my knowledge of history and the contributions of the Irish. It is a truly amazing story.